Designed for tactical applications that require minimal dust signature. A massive symmetrical blast baffle, combined with two compensated front baffles, redirect gas to the sides and upward delivering unparalleled recoil reduction while also minimizing muzzle rise and ground disturbance. High tolerance class-3 threads machined in same operation as bore aperture ensures perfect concentricity; this combined with a progressively decreasing baffle thickness minimizes bullet flight disturbance resulting in less yaw, higher BC, and improved accuracy. Computer FEA optimized for maximum strength to weight ratio and impact survivability. Precision CNC machined from high strength HTSR 400-series stainless steel bar for superior heat and corrosion resistance. Available in either an ultra wear resistant DLC (Diamond-Like Carbon) matte black finish, or stainless steel in-the-white, satin finish. Wrench flats on top and bottom for easy installation and removal. Accu-Washer Muzzle Alignment System advised for installation. SPECS: HTSR 416 stainless steel, HRC 28-32, DLC finish - matte black, or stainless in the white - satin finish. 7.62 & 338 versions are 1.375" wide, 1.188" high, 2.675" long (.850" dia. at barrel), 5.6 oz. weight. 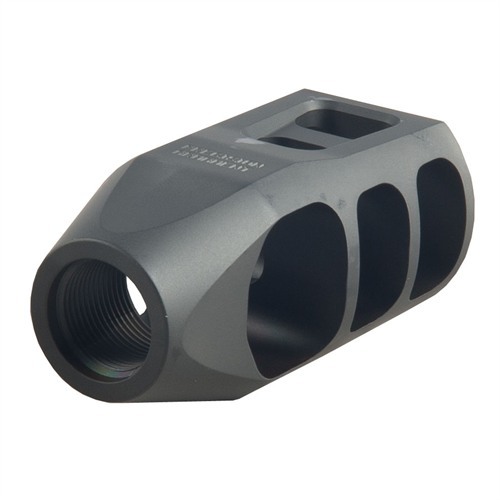 Fits up to .308/7.62mm caliber rifles with 5/8-24 threads. Use on 300 Win Mag with max loads. Very manageable recoil. Reluctant to try to compare difference in recoil without brake. It's a solid brake. Well-built and offers awesome recoil reduction. It is; however, incredibly loud. This works great. Obviously very well crafted and high quality. I like the way it looks too. does what it should, is loud but thats ok, when i installed it the first time with a crush washer it would not time, got the shims and its perfect. I had this muzzle break installed on my Remington 700 5R Mil-Spec. I took it to the range a week later and it made me love that rifle even more then I did before I installed the break. I was at an outdoor range and I was wearing muffs, but the other shooters did tell me that it was loud. My thoughts on a muzzle break making a gun louder then before are this: ITS A GUN GET OVER IT!!!! If you don't want to hear something loud then DON'T GO TO A SHOOTING RANGE!!! There was no impact on accuracy and the recoil from the Rifle was cut in half. It made that .308 Win rifle shoot like my AR-15 that is chambered in 5.56mm. Great quality of craftsmanship. I will be coming back to precision armament for the rest of my muzzle device needs. I tested this Brake before Brownells had them, and was blown away while comparing it to others that have been around for years. 1st off get the shim set-up to time it, this Co. makes the best shim kit in the industry. It worked amazing and while shooting prone, there was no dusting at all. Next the truth about Brakes is ,they don't make a gun any louder, they just expend gasses in places instead of straight downrange, therefore making it seem to be "Louder" Yes the people beside you will notice a difference but that's because gasses are being pushed out toward them. Eliminating recoil is NOT what a Brake does.. It's main design is to help with barrel harmonics, which improves accuracy, and reduces muzzle whip. GREAT CO. And glad Brownells offers them. I do believe we will start seeing more of them at the LR shoots, as well as on Varmint hunters guns. Good Job PA. Installed this on Savage 110 300 win mag. Reduced the recoil to a AR 15. Looks tatical on the gun. It is amazing to look at and use. Tightened my group up. Remember to order washer kit, when you buy. Make no mistake... this thing is BIG! If you want something low key on your rifle, forget it. The brake is very efficient... it gives of that side ways gust of wind when you shoot it. It's not any louder to me with headphones on. There's no obnoxious overpressure that makes you not want to shoot it. I like it a lot. I put this on a Ruger Gunsite Scout 308 that had a nasty recoil. Tamed it right down, and all but eliminated muzzle climb! Buy the washer kit too and you can't go wrong. Did not notice any additional noise or blast, no dust either. Best brake period! 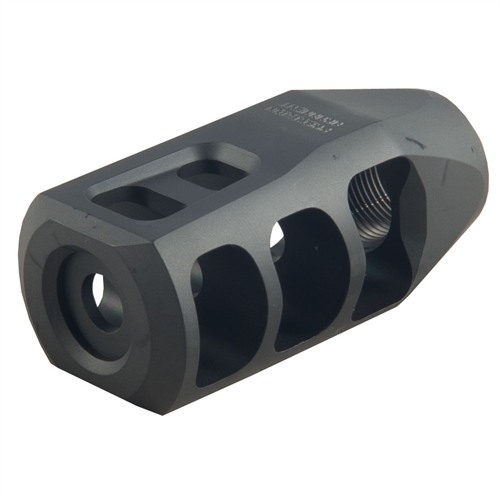 was trying to find a way to deal with muzzle climb and recoil for the Ruger GSR in .308. found this on the site and ordered with shim kit. installed per the instructions and went to the range. made a huge difference on muzzle climb and recoil. the GSR was a real pleasure to shot now. I have installed about 5 of these 3 on 7mm mags 1 on 25-06 and one on a 270all muzzle rise is eliminated the recoil on the 25-06 feels like a 22mag the 7mm mag is about a 243. This break is awesome. Problem: Tried to install this with the Precision Armament shim kit and had problems on my Savage 10 .308. It seemed I needed an intermediate washer between two washers. Took it to a smith and he shaved just a bit off one of the shims and now it aligned up perfectly. Overall: Brake is great! My bolt action now tickles when I shoot it, this brake does it's job on reducing recoil. It is big/bulky up front but and will change your bullet impact due to a change in barrel harmonics but my groups are still sub MOA. Fired it near the ground and had little dust signature as advertised. When spotting for m friend, the side blast was not bad as I thought, pleasantly surprised. Will buy again for my other rifles. Installed this on my Remington 700 AAC-SD in .308 and it made such a difference I was shocked. I've used several breaks before and I strongly believe this one could be the best! I can safely say that this brake reduced recoil by at least 60%. I compare it to my .22lr and it surely has less recoil than my AR15. It does increase the size of your rifle by almost 2" but if you're looking for a nice brake to reduce recoil, keep you one target and increase accuracy/follow up times this will do the trick... I train novice shooters, whom are recoil sensitive, with this brake they were able to shoot the "heavier" caliber without a problem. The ports on the brake are big but do not leave a dust signature nor does it disrupt the snow I am currently shooting on. All around a great product. Everybody before me, except the individual that had to shave some off the alignment ring, match what I have experienced with this muzzle break. I installed one (1) on two (2) of my Ruger rifles. One was on the Tactical M77 rifle and the other was on the Scout rifle. Can't improve on perfection. Wow. Significant reduction in recoil. Looks better then factory part on Ruger M77 308 Tactical. Installation a breeze with washer kit. Need only to emery paper nearest (use 320) oversize washer to get perfect fit. Reduced the recoil of my ar10 rifle considerably. Feels like an ar15. First day at the range, the guy next to me got starteled a bit due to the side generated pressures. Overall I am glad i purchased this muzzle device. Great design with oversized ports. Highly recommend. You will not regret. Just purchased a second one. Have had the first on a 300 WSM and the recoil is about half. The accu-washers are great, they make indexing super easy, plus no need to use excessive torque to get perfect clocking. Brings the recoil of my .338 Win Mag down to about the same as my 260-Rem. With muffs noise and blast are the same as without the brake. This brake is slightly larger and a few ounces more than the brake it replaced but this is a small trade off for the big jump in performance! I mounted this break on my gunsite ruger scout .308 and it made a tremendous difference. Recoil reduction and controlability is unsurpassed. Can shoot consistent touch hole groups at 100yds with no issue using cheap factory ammo. If you like to put a lot of rounds down range you need to have this break. OMG! Worth every penny. Reduced recoil by 80%. I saw a great video from a professional and some other Home made videos. I will tell you, it is a must have and I highly recommend it. It greatly reduces felt recoil and muzzle rise. Great price and easy to install. Also buy the Precision Armament Accu-Washers, they make the job so easy. I purchased this item because of the high rating, after install and shooting with it for 3 months I was not happy and satisfied on the recoil reduction. Lost target after the shot and had trouble lining up the Break with the Accu Washers. I installed this on a Mosin Nagant sporter and it reduces the recoil very well. The customer liked the large brake look, so I went ahead with it. Having not installed any competing muzzle brake on my DPMS LR-308, I can't say it's the best. While I do have one from DPMS, I suspect I won't be installing it because of the performance I've gotten from the M11 from PA. First, those in the lanes or beside you will not be happy with the amount of heat and pressure they will get being on the side of you. It's an absolute beast, but without a doubt, will almost complete eliminate the recoil on a DPMS LR-308. I have it coupled with a JP Enterprises Silent Capture and the rifle has barely the recoil of my Bushmaster XM15-E2S. Follow up shots are nearly instant without the normal abusive bounce. Not only would I recommend it to others, I recommend it to my friends. Installed this on my DPMS 308 today and got to take it out to the range. First thing, this break looks amazing, I included some pictures to give an idea of size next to my old one, and what it looks like on the gun. Second, having fired my DPMS both with and without this break I can tell you it makes a world of difference. It felt more like shooting my friends M&P 15 than a .308. The only down side, like most people have mentioned, is the amount of gas it kicks out to the sides. Not a big deal for me, but I generally shoot at an indoor range with individual stalls. So I don't have to worry about the person next to me. That all said, I'm very happy to have spent the money on this. Makes shooting even more enjoyable. Just received the Muzzle Brake today. Installation was a snap with Accu Washer kit (great idea). Fired my AR10 and could not believe the recoil reduction (at least 65-70%). Can't wait to go to the range and really see the benefits. Great product! After much research I purchased this for a Christmas gift for myself. My gunsmith installed in less than 5 minutes on my Ruger SR-762. It is loud as you might think. It also seems to reduce the .308 recoil to something less than my 30-30 maybe even less than a 5.56 but that's just my opinion. I purchased the spacers that others recommended. . I am quiet pleased. I had a hog problem. Before mounting this on a Sig716 with a factory muzzle the gun popped & hopped. The M11 helped settle things down & made follow up shots much quicker & MORE ACCURATE. I also got the washer kit. It worked well & makes installation easy. Check the link at the bottom of the paragraph/description for the washer kit & make sure it's 5/8x24 Precision Armament kit. When I ordered mine the link went to the 1/2x28 washer kit (Brownells needs to fix that). I really like this muzzle brake, it's the best addition to the rifle next to the Geissele SSA-E trigger & the Vortex Viper with a Spuhr mount. All from Brownells! Wow. That's it. Makes my Remington 700PSS 300WM shoots like an AR-10. Wow. I bought this brake to tame down a savage 10t-sr 300 winn mag. What a difference, It's unbelievable! I will never buy another high-power rifle that is not threaded. I've shot boxes of ammo through this and am not the least bit sore after. I would say that the recoil is now somewhere between a 22- 250 and a 243 (i have both). I even let my wife who is under 130 lbs and had never shot a magnum rifle of any kind, shoot it twice. she didn't even notice the recoil. (She smoked a milk jug at 400 yards). Spend the money and get it you won't even look back once you fire you first shot. Mfr Part: A04006 Designed for tactical applications that require minimal dust signature. A massive symmetrical blast baffle, combined with two compensated front baffles, redirect gas to the sides and upward delivering unparalleled recoil reduction while also minimizing muzzle rise and ground disturbance. High tolerance class-3 threads machined in same operation as bore aperture ensures perfect concentricity; this combined with a progressively decreasing baffle thickness minimizes bullet flight disturbance resulting in less yaw, higher BC, and improved accuracy. Computer FEA optimized for maximum strength to weight ratio and impact survivability. Precision CNC machined from high strength HTSR 400-series stainless steel bar for superior heat and corrosion resistance. Available in either an ultra wear resistant DLC (Diamond-Like Carbon) matte black finish, or stainless steel in-the-white, satin finish. Wrench flats on top and bottom for easy installation and removal. Accu-Washer Muzzle Alignment System advised for installation. Mfr Part: A04007 Designed for tactical applications that require minimal dust signature. A massive symmetrical blast baffle, combined with two compensated front baffles, redirect gas to the sides and upward delivering unparalleled recoil reduction while also minimizing muzzle rise and ground disturbance. High tolerance class-3 threads machined in same operation as bore aperture ensures perfect concentricity; this combined with a progressively decreasing baffle thickness minimizes bullet flight disturbance resulting in less yaw, higher BC, and improved accuracy. Computer FEA optimized for maximum strength to weight ratio and impact survivability. Precision CNC machined from high strength HTSR 400-series stainless steel bar for superior heat and corrosion resistance. Available in either an ultra wear resistant DLC (Diamond-Like Carbon) matte black finish, or stainless steel in-the-white, satin finish. Wrench flats on top and bottom for easy installation and removal. Accu-Washer Muzzle Alignment System advised for installation.